Through a special partnership between Cotton Incorporated and Context Network, all non proprietary cotton data is now available through a tool called SeedMatrix. And now, a tutorial webcast is available to teach users how to effectively navigate SeedMatrix. The central focus of the Agricultural and Environmental Research department at Cotton Incorporated is recognizing and responding to issues cotton producers identify as having an impact on their farm. Timely access to objective information about new cotton varieties is a top priority to both cotton producers and consultants. SeedMatrix, a product of Context Network, is a data-driven, web-based software program which allows users to find the best varieties available based on a range of criteria, including their geographic location, soil texture, irrigation type, and desired technology traits. This freely accessible information spans 10 years and over 2,000 test plots worth of data. The webcast, titled “SeedMatrix.com” demonstrates how growers, consultants, or other practitioners in the cotton industry can get the most use out of SeedMatrix. Author Dale Logan, Manager of SeedMatrix, gives a 15-minute tutorial of the SeedMatrix software platform and its features. This overview shows users how to: access single trial data for cotton varieties; view head-to-head comparisons of specific cotton varieties; compare one variety versus all others it was tested with; and see the top performing products in various regions. By the end of this presentation, users will understand how to effectively use SeedMatrix as a tool for more informed variety selection. This webcast is part of the ‘Focus on Cotton’ series made available by the Plant Management Network and Cotton Incorporated. ‘Focus on Cotton’ contains nearly 30 webcasts on various aspects of cotton crop management. These talks are accessible any time and cover agronomic practices, crop protection, and ag engineering. This resource also features a new and improved Cotton Extension Search tool, where users can conveniently search for extension resources across all U.S. land-grant universities serving cotton producers. All of these resources are freely available courtesy of Cotton Incorporated at: http://www.plantmanagementnetwork.org/foco. There is still time to complete Cotton’s Natural Resource survey and get a free t-shirt. 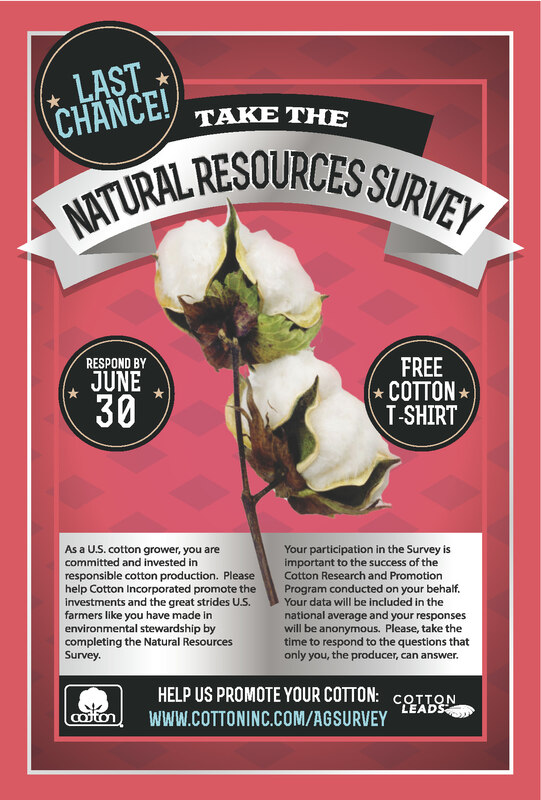 In early March, Cotton Incorporated initiated a Natural Resource Survey to seek input from all U.S. cotton producers. It is a continuation of the effort launched in 2008 to assess production practices and provide documentation of the sustainable cotton production practices used in the U.S. American cotton producers have made great strides in improving the environment of their cotton fields in the last three decades. Soil loss is down 68 percent, irrigation use is down 75 percent and energy use is down 31 percent. The Cotton Research and Promotion Program and Cotton Incorporated are dedicated to continuing this progress and are committed to promoting cotton as one of the world’s most environmentally friendly fibers. The 2015 survey will accomplish several objectives, including: measuring progress since 2008 and providing data to update a global cotton life cycle assessment data set. The results of the survey will be provided to the industry through Cotton LEADS™. The Cotton LEADS program is committed to responsible cotton production and is founded on core principles that are consistent with sustainability, the use of best practices and traceability in the cotton supply chain. The survey was announced by postcard in early March, and there is still time to participate. It is administered on-line, consists of 50 questions related to management practices, and on average takes less than 30 minutes to complete. As an incentive to participate Cotton Incorporated will be providing t-shirts to the first 1,000 participants. Dr. Ed Barnes, Senior Director, Agricultural & Environmental Research at Cotton Incorporated said ,“We are more than half-way to our survey-completion goal and need those who have not participated to complete their survey so we can tell the most robust story possible about U.S. cotton. And, there is still a chance to get a t-shirt if you hurry.” To participate please use the link provided on your postcard, or go to: http://www.cottoninc.com/ag-esurvey/. HanesBrands, Jo-Ann Fabrics, Kohl’s and Life Is Good are the newest additions to the partner list for the Cotton LEADS™ program. Since its establishment in 2013, Cotton LEADS has attracted more than 300 partners from across the global supply chain. During a recent luncheon in Gastonia, NC, the U.S.-based partners were updated on the program’s activities and recognized the latest partners. More than 30 representatives from 20 brands, retailers and businesses across the cotton supply chain attended the event. The Cotton LEADS™ program was launched to illustrate, at a national level, the responsible production practices of cotton growers in Australia and the United States – the program’s two founding countries. At the heart of the program is the commitment to continuous improvement in cotton growing practices in these countries. This is possible thanks to the strict national and regional regulatory environments in each country, grower self-investment in research and development, and the ability to affect best practices at a national level. “The goal of the Cotton LEADS™ program,” explains Mark Messura, senior vice president of Supply Chain Marketing at Cotton Incorporated, “is to assure the industry that the cotton entering their supply chain is being produced in an increasingly responsible manner.” Cotton LEADS™ cotton represents approximately 17 percent of global cotton supply. The Cotton LEADS™ program will host a scientists’ roundtable later in the year to discuss research priorities for the program and the dissemination of that research to the global cotton community. After trending higher from mid-March through the end of April, values for NY futures and the A Index turned lower in May. Chinese prices have been stable, while Indian and Pakistani prices increased. Prices for the nearby July contract (NY futures) met resistance near 68 cents/lb in late April and have retreated to levels below 65 cents/lb. The A Index also reversed direction in the first two weeks of May, with values declining from levels near 75 cents/lb to those below 72 cents/lb. -- In their May report, the USDA released their first complete set of estimates for an upcoming crop year. The projection for world production in 2015/16 is 111.3 million bales, which represents an 8.0 million bale decrease (-6.7%) relative to the 119.3 million bales harvested in 2014/15. The forecast for world mill-use in 2015/16 is 115.3 million bales, which represents a 3.8 million bale increase (+3.4%) relative to the 111.5 million bales consumed in 2014/15. In combination, the smaller crop and the increase in use are expected to result in the first production deficit in six crop years. This implies a decrease in ending stocks, and the estimated decline in warehoused supplies is 4.0 million bales (from 110.3 million to 106.3 million). However, global ending stocks have set a series of successive records over the last four crop years, and there should be little concern of shortage. Warehoused supplies at the end of the upcoming 2015/16 season are expected to remain above 90%. -- Government policy, and its effects on trade flows, has been influential on global price direction for the past several crop years. In 2015/16, Chinese import demand is expected to weaken further, and to drop from 7.7 million bales to 6.0 million (-22%). This volume is less than one third of the average between 2011/12-2013/14 (19.7 million bales). Ending stock levels in exporting countries have had a strong influence on world price direction in recent years, and limited Chinese import demand should offset some of the impact of decreases in acreage and production on the supply situation in exporting countries next crop year.